Vegetarians rejoice: we too can have meatballs with our goddamn meal, just like all those carnivores out there. This soup is soooo.freaking.yum. Well, it’s really good that is, if you like Thai dishes, coconut milk, and tons of exotic seasoning. Plus, coconut milk is amazingly good for you. So, hip hip hooray! Another plus is that the ingredient are light enough to make a good summer soup. My husband really hates ginger (and yet…he married a ginger kid. Conflict of interests? I should say so…) and so he wasn’t as big of a fan of this soup as I thought he’d be (I expected Domestic Goddess awards, but it was not to be. Note to self: no ginger root for Samuel!) However, despite his ginger flavor aversion, he was blown away by the amazing aromatic quality and how tasty the “meatballs” are. In a nutshell, it’s pretty heavenly. Forget Calgon taking you away, these flavors will make you feel like you’re a million miles from home in the best way possible. Soup is such a comfort dish as it is, and it was a perfect rainy day in the city when I threw this together for my husband and me. It was a great meal to curl up on the sofa with a glass of white wine and enjoy together…well…minus the ginger. CAN’T WIN THEM ALL, FOLKS 😉 He still ended up giving me the Domestic Goddess award, so it all worked out. I will add one caveat about this dish: it does have a list of ingredients not commonly kept in our American pantries. Fortunately, a little goes a long way, and these are pretty interchangeable with most middle-Eastern and Asian cuisine, so all is not lost. Now, on to the recipe! First, make the zucchini “meatballs.” I make a larger batch, because you can easily store the mix and make additional meatballs (I can stop using quotation marks now, right?) for later, or fritters, zucchini burgers, and all manner of fabulous foods. After shredding zucchini in food processor, set aside while you lightly caramelize the onions, red pepper flakes, and minced garlic to bring out the flavors. Next, add the zucchini, and sprinkle with curry to taste. Add salt to pull out some of the moisture of the zucchini. Pull pan off heat, then add zucchini to bowl along with: flour, panko, eggs, and cheese. Mix gently together and form medium sized meatballs. I like to bake mine for about 15 minutes to get them a little crispy, then add them to an oiled pan on med-high heat. 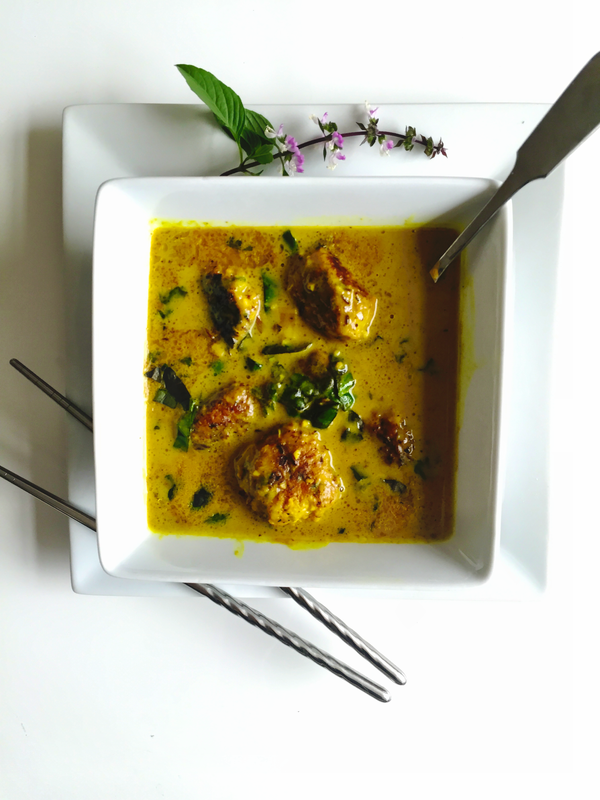 Toss in coriander seeds, turmeric, curry powder, lemon grass and ginger root (unless you’re cooking for my husband, and then forget it) to pan and make sure there’s enough oil (or dash of stock) to pull flavors to meatballs. The meatballs will continue cooking and soak up those delicious flavors. Talk about yum! It smells so good. When the meatballs are getting crispy, turn and allow to cook for a bit, then pour in coconut milk and stock. Add some basil. Stir and allow to cook for an additional 10-15 minutes. When it’s finished, ladle into bowl and add basil to soup and sprinkle lime zest on the meatballs and squeeze a dash of lime juice to brighten the broth. Serve with a nice low-alcohol white wine like Riesling or Gewürztraminer , or a light red that’s like a multi-purpose Zinfandel, which pairs nicely with Thai dishes. What the heck, drink whatever makes you happy! When it comes to wine, my motto is: “Please sir, can I have some more?” Too much of a good thing can be fabulous! 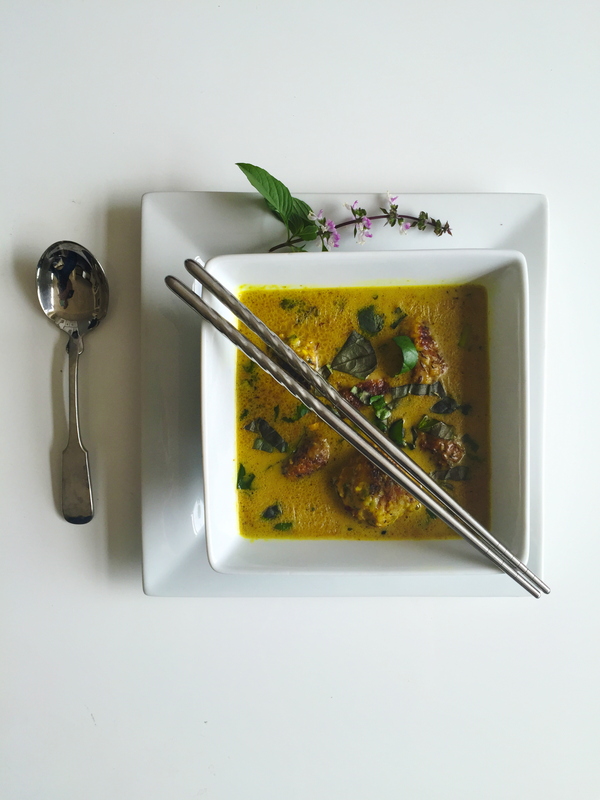 I hope you like ginger root (and ginger kids) so you can give this soup a try! Happy Sunday Funday!